Kraftmaid brand kitchens haves supplied cabinets for more home owners then any other cabinet manufacturer in the world. The custom look of a Kraftmaid kitchen is achieved by offering a huge selection of styles and woods, coupled with wonderful innovations that make your dream kitchen both beautiful and practical. 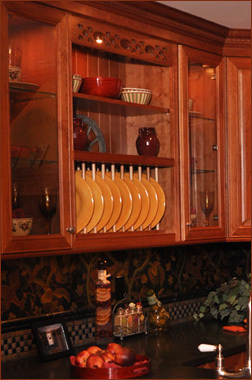 Their style, finishes, and storage solutions, coupled with decorative hardware give your kitchen project a custom look without the custom price. KraftMaid’s Passport Series offers improved usability, and convenience, combined with fine design features, at a very affordable price. The Passport Series is recognized as the innovator for accessibility, and is the only cabinet series certified for Universal Design. For those with physical or height limitations the Passport Series offers KraftMaid’s rigorous quality construction standards plus special options that can enhance life. It is their most versatile cabinet line.